Home » ios » How to Convert WMV to iPad mini to Play WMV files on iPad mini? How to Convert WMV to iPad mini to Play WMV files on iPad mini? With the debut of the new iPad mini, we have to admit that it is a concentration rather than a reduction of the iPad. It is the smallest possible iPad that could still deliver the full iPad experience. It fits in one hand, yet it can do everything an iPad can do and work with all the apps made for iPad. And because the iPad mini is an iPad in every way, iPad mini still cannot support Windows Media Video - WMV. iPad mini will refuse to import WMV files, let alone to play WMV on iPad mini. What if we have plenty of WMV video in hand and want to play them on iPad mini? In fact, it is that easy to solve "can't transfer and play WMV on iPad mini" issue: A preferred solution is to convert WMV to iPad mini supported format. 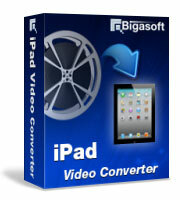 Bigasoft iPad Video Converter is just the right WMV to iPad mini Converter. It can fast convert WMV to iPad mini supported video format like MP4, MOV. Besides converting WMV files to iPad mini video format, this powerful WMV to iPad mini conversion software also enables to only extract audio from WMV music video and then convert WMV files to iPad mini supported audio format like MP3, M4A. It even helps to convert other videos like AVI, MKV, FLV, MPG, WTV, MXF, VOB, 3GP and etc to iPad mini compatible format. The following is a step by step guide on how to convert WMV video files to iPad mini supported format with the help of Bigasoft iPad Video Converter. Then it is just easy to transfer WMV to iPad mini for successfully playing WMV on iPad mini. 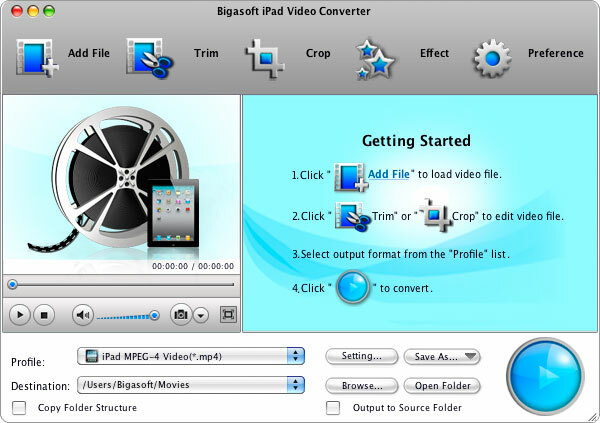 Free download, install and run the professional WMV to iPad mini conversion software - Bigasoft iPad Video Converter (Mac Version, Windows Version), the following interface will pop up. Click "Add File" button to import the WMV files which you want to play on iPad mini to Bigasoft iPad Video Converter. If you have lots of WMV files, you can drag the folder where you WMV files are to this WMV to iPad mini Converter. It will automatically load all your music and video files in that folder. Click the "Profile" drop-down button, and then go to "iPad" category to select iPad mini H.264 Video (.mp4) as output format. Click "Convert" button to start converting WMV to iPad mini supported video or audio format, it will be finished with high output video and audio quality and fast converting speed. When the WMV iPad mini conversion is done, click the "Open Folder" button to find the converted WMV files. Then simply sync the converted files to iPad mini by via of iTunes to play WMV on iPad mini on the go.